Redbreast Whiskey Lustau Editon Sherry Finish / 46% / – Redbreast whiskey was introduced in 1939. It was pure pot still whiskey from John Jameson & Son Distillery in Dublin marketed and distributed by W. & A. Gilbey. Currently the brand is owned by Pernod Ricard and is produced in Midleton Distillery in Cork, the only commercial distillery producing pot still whiskey. 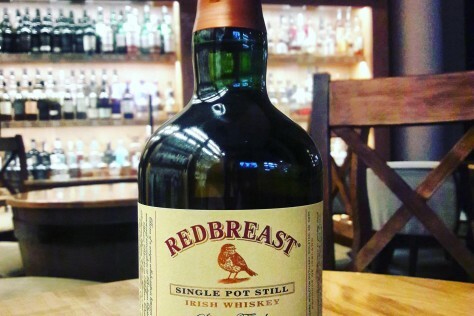 Redbreast whiskey is distilled from mash of 50% malted and 50% unmalted barley and aged in mix of ex-bourbon and ex-sherry casks. The Lustau Edition comprises whiskey finished for an extra year in first fill sherry butts seasoned with Oloroso sherry sourced from Bodegas Lustau and bottled with alcohol content increased to 46% abv. Nose: intense, prunes, dates, figs, bitter orange marmalade, marzipan, vanilla, nougat, crème brûlée, candied ginger, touches of aniseed and oak. Palate: very rich sherry notes, dark berries, prunes, oranges, figs, hazelnuts, vanilla custard, toffee and perfectly integrated spicy and oaky notes. Finish: extremely long, lots of sherry, dark fruit, mix of dried herbs, hints of leather and oak. Buy bottle at Dom Whisky Online or in or whisky shop in Reda, Wejherowska 67.